1780 December, Great Britain declares war on the Netherlands. Britain immediately begins to prepare a fleet for the purpose of annexing the Cape. France, an ally of the Netherlands, gets wind of this and hastily divert a fleet intended for the Indian Ocean, to the Cape. Admiral Suffren’s whose squadron lies in wait for the British ships at Santiago in the Cape Verde Islands, launches a surprise attack on the fleet of Commodore Johnston, and does considerable damage. The French then sails off to prepare the Cape against an attack from Britain, wich does not materialise. 1781 2nd July The French Regiment of Pondichery arrive at the Cape, with 1747 men. 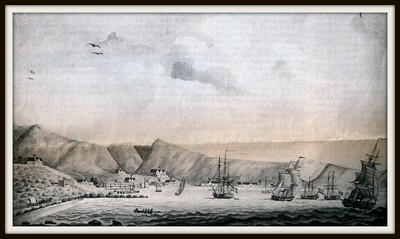 The presence of the French fleet at Cape Town naturally provided a splendid market for the colonist’s produce. Prices soare to such a height that the council, anxious not to annoy the Cape’s defenders, fix maximum rates for grain, wine and meat. The rise in prices come just in time to lift the colony from the trough of a bad depression. The French continue to demand provisions, not only for the Cape garrison, but also for their forces in India. The political importance of India at this time meant that an ever increasing number of vessels visit the Cape. The Danes were especially welcome, because they brought luxury goods from Europe and the East, which they sell to the Capetonians, at exorbitant prices. The presence of the foreign troops raise demands for accommodation in the city. Wasteland on the slopes of Signal Hill are divided into plots for housing construction. The area became known as the ‘Bo-Kaap’. 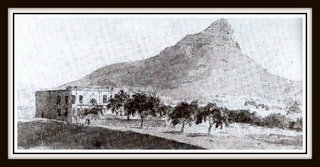 Balls and banquets transformed social life, and the French troops established Cape Town’s first theatre where men perform both the male and female parts. Ladies were carried to and from functions and church in sedan chairs that now appeared on the street for the first time. Coaches with slaves in livery were also seen. The citizens of Cape Town, bent on acquiring refinement and polish in their way of life, spent large sums of money beautifying their houses and filling them with objects of taste and expensive furniture, which was manufactured from stink-wood, yellow-wood and beef-wood. Built-in glass-fronted cupboards, or free standing ones, in which beautiful oriental and Dutch china and porcelain were displayed, became a feature of many homes. Silversmiths establish themselves in the town and began to turn out the famed Cape silver. Door handles and key escutcheons were often made of silver or brass, while coppersmiths turned out a wide variety of utensils. Many of the finest examples of the gabled and thatched Cape Dutch houses were erected during this period. A number of these were the results of the combined efforts of three men who often collaborated and who, during the next thirty years were having a profound influence on local architecture. They were Louis Thibault, a Paris-educated architect who came to the Cape with the Meuron Regiment, Anton Anreith, a sculptor and artist of German heritage and Herman Schutte, a builder from Holland. Schutte designed and rebuilt the Groote Kerk and he built the Lodge de Goede Hoop which was designed by Thibault. Thibault was credited with the design of the balcony of the Kat in the Castle, the Public Works Department Building in Buitenkant Street and the renovation, as Government offices, of the old Supreme Court Building (Slave Lodge). Anreith sculptured the lionesses on the gateway of the Castle. A particularly fine example of his work can be seen on the pediment of the wine cellar at Groot Constantia. He was also responsible for the pulpit and organ case in the Lutheran Church in Strand Street. A typical town house in Cape Town house had pilasters on its facade and a carved fanlight over the front door. Cornelis de Jong, a Dutch traveller who visited Cape Town in 1791, and published his travel journal nine years later, remarked that “building is here not only a hobby, it is a passion, a craze, a contagious madness, which has infected everybody”. 1784 Literature and printing The first printing press, worked by hand, is brought to the Cape by the Bavarian, J. C. Ritter, who is appointed as bookbinder to the Company. He used it laboriously to print a few almanacs, handbills and letterheads. The Company itself made no use of print for its official documents and records at the Cape. 1785 Colonel van de Graaff, a military man, replaces van Plettenberg as governor. Extravagance at the Cape was further stimulated by his example. His stables and entourage became a by-word in the colony. This prosperity lasted for nearly ten years. The ships came rolling into Table Bay, and the grain and beef and wine go pouring out. It was a wartime boom, and people borrow and spent recklessly. 1791 The Cape Colony is once more on the brink of extreme depression, while the company, (VOC) practically bankrupt, can do nothing to help. The War of American Independence was the final blow to the company’s already tottering financial stability. The British had captured dozens of its ships, and its East Indian possessions were proving less and less profitable. The Cape was the least profitable possession of them all. The Governor, van de Graaff, who was a friend of the Prince of Orange, has an inflated idea of the importance of his government. Money was lavishley spent on the new hospital and the Governor, had one hundred and thirty-six horses for his own use. His lifestyle was far more lavish than any of his predecessors. The cost of the new defences, included the construction of the Amsterdam Battery (at the present day Waterfront entrance), with barracks for two hundred soldiers and a magazine, the strengthening of the Imhoff Battery, in front of the Castle, the erection of three batteries at Hout Bay and the maintenance of the French lines which run from Fort Knokke (present day Woodstock Station) to Zonnenbloem Estate on the slopes of Devil’s Peak, was enormous. Annual expenditure rose fivefold and the directors, complaining that the Colony was costing the Company more than all its East Indian stations combined, implement strick economic reform measurements. Van de Graaf was recalled, Newlands House was sold off, along with most of the Governor’s horses and carriages. All public building was suspended and most of the Company’s slaves were sold. 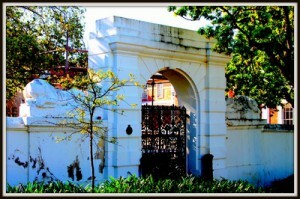 The fortifications and the new military posts in the Swellendam district were closed down. The garrison was drastically reduced, when nearly all the mercenaries were sent home. The 1,500 officials, 14,000 burghers and 17,000 slaves were left to fend for themselves. The States General, impatient at the company’s belated attempts at reform, appoint a commission of four members to investigate its affairs. Two members of this Board, Nederburgh and Frykenius, visit the Cape, with special instructions: to see that the instruction to cut expenditure are obeyed, to increase revenue, and put an end to corrupt practices. The Commissioners themselves were certain that the company is doomed, but are determined to stave off the evil day as long as possible. They cut all the official’s salaries, allowing them small but adequate salaries and fees, for various services. They leased the company’s garden and the governor’s countryseat at Rustenberg, and even the saltpans at Algoa Bay. They imposed taxes and duties on the value of all goods imported or exported from the colony by anyone but the company. Having done their job, the Commissioners appointed Abraham Josias Sluysken, a capable administrator who had been director of trade at Surat, Commissioner-General of the Colony. He had no military experience and war had again broken out in Europe between England and the Netherlands on one side and, and on the other, side the republican France, which now was bent on imposing the doctrine of Liberty, Equality and Fraternity on an unwilling Europe. 1793 1st February, The once mighty East India Company is unable to meet even the interest on its loans, insolvent to the tune of tens of millions, hand its colonies over to the Dutch Government. 1793 March, France declare war on Great Britain and the House of Orange. 1794 The Prince of Orange flees to Britain, The now resurgent Patriot Party welcomed the French with enthusiasm to Amsterdam, and Holland set up the Batavian Republic in alliance with France. News of these developments only gradually seeped through from neutral sources to the authorities at the Cape. Confusion could hardly be worse. The high officials and principal military officers were pro-Orange while the majority of the burghers were pro-Patriot and, by the same token, pro-French.